In Uruguay, football is life and death. The desire to win has led to desperate actions that would normally be written off as lunacy in other parts of the world. Indeed, incidents involving Luis Suárez and Álvaro Pereira show how such a desire continues to this day. Every match, Uruguayans leave everything on the pitch to prove themselves to the world. The World Cup of 1954 showed that not even death could break their will to win. Juan Eduardo Hohberg was born in Córdoba on October 8, 1927. He was Argentine. In 1948, Hohberg arrived at Peñarol, and was soon an indispensable member of what became known as La Máquina, led by Hungarian Emérico Hirschl. Quickly earning the nickname ‘verdugo’, the executioner, Hohberg was known to terrorise opponents with his powerful finishing. Playing alongside one of Uruguay’s greatest generations of footballers including Miguez, Schiaffino, Ghiggia, and Obdulio, he helped Peñarol win seven titles, embarrass their rivals, and win the first Copa Libertadores. Hohberg was special, with calls to bring the Argentine into the Uruguayan national team made almost instantly. Attempts were made to select him for the 1950 World Cup, but failed. He’d get his chance in 1954. The defending world champions arrived in Switzerland and swept aside all. In the group stage, Czechoslovakia were dispatched 2-0, while Scotland were decimated 7-0. Dominance over the British continued with a 4-2 Quarter Final win over England. Next up, a Semi Final encounter with the legendary Hungarians. Hohberg had watched Uruguay’s impressive start to the tournament from the bench. However, the absence of Óscar Miguez and Julio Addabie for the Hungary match finally presented him an opportunity. The 1954 Semi Final pitted two of the greatest sides of all time against each other. The Hungarians had been unbeatable for years. Uruguay, having won the World Cup in their only two appearances in 1930 and 1950, had never lost on the world’s biggest stage. Hungary came out hard with two goals in the first half. Uruguay’s World Cup record was under serious threat. They came back however through Hohberg, who latched onto a Schiaffino pass and placed the ball into the net. 1-2, 75 minutes gone. Ten minutes later, the equaliser. Again, it was Hohberg with the agonising goal. Uruguay were back in it. Having leveled the match with only a few minutes remaining, Uruguay’s undefeated record, and hopes of a third consecutive World Cup, remained intact. There were chaotic scenes of jubilation. Hohberg was overcome by his teammates, who piled onto the Peñarol, and now Uruguay, hero. When his teammates got up however, he was still down. 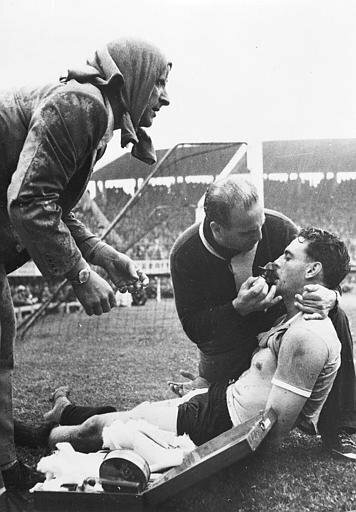 The team doctor Carlos Abate ran across the field to the fallen Hohberg. He had suffered a cardiac arrest. He was given chest massages and a shot of coramine. He was gone for fifteen seconds, but he came back. Hohberg returned to the pitch and played for the rest of the match. It was an act befitting the dramatic nature of a contest regarded as one of the greatest ever. However, Hohberg’s efforts could not stop the amazing Hungarians, with two Kocsis headers giving them a 4-2 victory after extra time. Further demonstrating his extraordinary commitment, Hohberg played in Uruguay’s 3rd place playoff, scoring in their loss to Austria. They say that the pressure of Hohberg’s teammates caused his collapse. They’re wrong. It came from a moment of realisation, a culmination of fears that maybe Uruguay were no longer the best in the world. Minutes away from elimination, Hohberg brought Uruguay back from the brink. For a moment, it cost him his life. Hohberg personified Uruguay’s desperate need to remain relevant through football. While the fears and expectations generated by the sky blue shirt caused his collapse, they equally motivated him to keep fighting. He wasn’t even born in Uruguay. Juan Hohberg. Another Argentine who suffered so that Uruguay could triumph.